We are excited to finally complete our LEED certification as we are conscious of the impact we are making on the environment and are doing our part to be green and reduce our carbon footprint. Baywood Hotels is pleased to announce the Hampton Inn & Suites Washington DC North/Gaithersburg is now LEED-certified. LEED is the most widely used third-party certification for green buildings. The achievement is given for implementing practical and measurable strategies and solutions aimed at achieving high performance in: sustainable site development, water savings, energy efficiency, materials selection and indoor environmental quality. 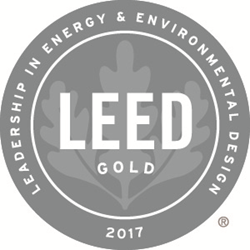 LEED, which stands for Leadership in Energy and Environmental Design, is the foremost program for the design, construction and operation of green buildings. LEED-certified hotels are resource proficient as they use less energy and water and diminish greenhouse gas. “We are excited to finally complete our LEED certification as we are conscious of the impact we are making on the environment and are doing our part to be green and reduce our carbon footprint” says Xitlaly Castillo-Dietz, General Manager. For more information, please visit our Hampton Inn website or call us at +1-301-990-4300.